We hope you like the website and that you find it informative, educational and interesting and ultimately sends you in to meet the team. At Sunbeams we pride ourselves on our customer service and providing one on one tanning & beauty advice with a smile. The team are a very experienced and diverse bunch and offer the best in customer care in a friendly and professional way. Our main aim is looking after your skin, after all it's the largest organ you have, we aim to get you tanned safely in a friendly, clean and well maintained environment. Our sunbeds are regularly re-tubed, by Ergoline, who are our sunbed suppliers, anyone who know's anything about sunbeds knows all about the excellent reputation that follows Ergoline and its products. Why not try our exclusive to Sunbeams, " Sun Angel Sunbed " - the only bed of its kind in the Crawley area. Sensor safe tanning. Advice on how to get the best tan safely is what we do and to that end we can offer you a wide range of tanning lotions to help with your tan which also moisturise your skin and contain many excellent Vitamins which the skin and your body need. They start at only at £2.00. Sunbeams has been in Pound Hill, Crawley since December 1999 and is going from strength to strength, over the last two years we have added many new products to the salon including eye lash extensions, teeth whitening, beauty treatments, facial rejuvination, semi-permanent tattoo'd make up and much more, please have a look at the following pages for more information. We also have many offers on the go throughout the year which include courses for sunbeds, various discounts for our seniors, air crew, Nurses, loyal customers and much much more. 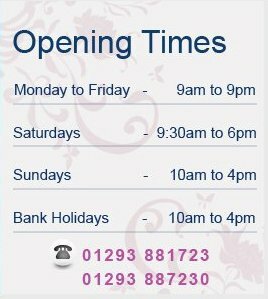 If you have any questions please ring us, we are open seven days a week, or send us an 'e' mail and we will get back to you as soon as possible.